On Oct. 5, as Triton passes in front of a faraway star it will block the star’s light in an eclipse-like event called an occultation. During the celestial alignment, the team aboard the specially equipped Boeing 747SP aircraft will make observations of the distant star’s light as it passes through Triton’s atmosphere. Triton has not passed in front of bright stars for many years, making occultation observations difficult. Now, as Triton passes in front of a bright star, the data collected by SOFIA’s 100-inch (2.5-meter) on board telescope and three powerful instruments will enable researchers to better study and characterize the moon’s atmosphere, including its temperature, pressure and density. Previous observations, including those from NASA’s Voyager 2 spacecraft taken in 1989 and a previous occultation observation in 2001, indicate that Triton’s atmosphere is made mostly of nitrogen and is distorted at different locations by its high winds and strong tides. These new occultation data may also provide details about how the atmosphere varies at different altitudes, enabling researchers to examine if the atmosphere has changed since it was last studied. Catching Triton’s shadow as it races across Earth’s surface at more than 37,000 mph (17 km/s) while the aircraft is traveling at Mach 0.85 (approximately 652 mph), is no small feat. To ensure that they are in the right place at the right time, researchers have made advanced observations of Triton and the star with multiple telescopes to determine the location of their shadow. From these precise calculations, SOFIA’s flight planners have designed a flight plan that will put the flying observatory in the center of the shadow for approximately two minutes as Triton aligns in front of the star. Though challenging, SOFIA’s team has previously used this method to make successful observations of Pluto’s atmosphere with SOFIA in 2011 and 2015. Additionally, researchers on SOFIA’s predecessor, the Kuiper Airborne Observatory, discovered Uranus’ rings while studying an occultation by that planet in 1977. Triton has strong tides because it is close to Neptune, much closer than our moon is to Earth. These powerful tides combined with its strong winds, change the shape of its atmosphere. To measure the overall shape of Triton’s atmosphere, the researchers are also teaming with more than 30 ground-based telescopes across the Eastern United States and Europe. Most of these telescopes are not located where the center of the shadow will fall, but they will make simultaneous observations of different areas of Triton’s atmosphere to get a global view of its shape. The data from across Earth, combined with that collected onboard SOFIA, will help researchers understand how these forces influence the atmosphere. The borders of Triton's shadow across Earth's surface are indicated by black lines on this map, while the orange line is the path of the shadow's center. SOFIA’s flight path is represented by the red line; the point of the crucial, two-minute observation of Triton as it aligns with the star is marked by the airplane. The red and blue dots represent the ground-based telescopes that will also observe Triton. “The ground-based campaign augments both the visible and infrared data from SOFIA, to give us a global perspective of Triton's atmosphere,” Kimberly Ennico Smith, SOFIA project scientist at NASA’s Ames Research Center in California’s Silicon Valley. The center of Triton’s shadow, which is predicted to fall over the Eastern United States, the Atlantic Ocean, and Europe, is far from SOFIA’s home base at NASA’s Armstrong Flight Research Center in Palmdale, California. For this flight, the flying observatory will operate from a temporary base in Daytona Beach, Florida, to complete these observations. 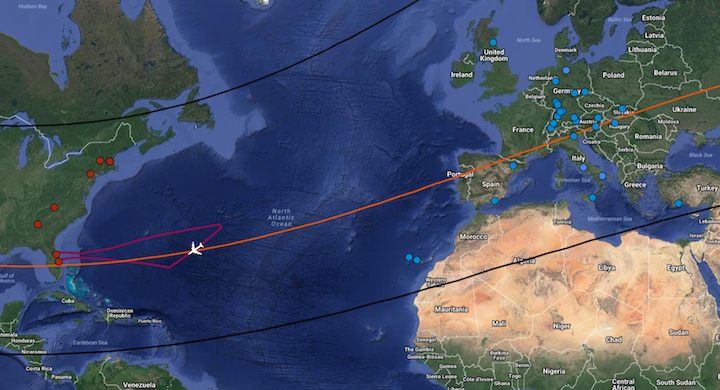 From Florida, SOFIA can reach the shadow’s center and return during a single, nine-hour observing flight. Follow along on social media with @SOFIAtelescope and #NeptunesMoon as SOFIA chases Triton’s shadow, and join the mission crew live with NASA on Snapchat on Oct. 5. SOFIA is a joint project of NASA and the German Aerospace Center, DLR. NASA’s Ames Research Center manages the SOFIA program, science and mission operations in cooperation with the Universities Space Research Association headquartered in Columbia, Maryland, and the German SOFIA Institute (DSI) at the University of Stuttgart. The aircraft is based at NASA’s Armstrong Flight Research Center's Hangar 703, in Palmdale, California.